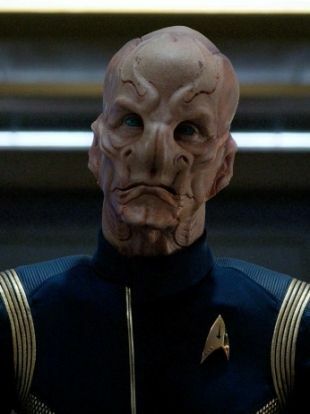 Saru was the first Kelpien to join Starfleet. He had a first contact specialist qualification. In 2249, Saru had obtained the rank of lieutenant and was serving in the sciences division aboard the USS Shenzhou under Captain Philippa Georgiou as a bridge officer. He was present when Michael Burnham arrived on the starship. By 2256, he had been promoted to lieutenant commander and worked as the ship's chief science officer. That year, Saru participated in the Battle of the Binary Stars, and later evacuated the Shenzhou with the remaining crew after the death of Captain Georgiou. About six months later, Saru had been promoted to commander, transferred to the command division, and made first officer of the USS Discovery under Gabriel Lorca. When the prison transport shuttle carrying the disgraced former Starfleet officer Michael Burnham was brought aboard the USS Discovery for repairs, Saru escorted the former officer to engineering so that she would work as a "data cruncher" under Lieutenant Paul Stamets. When the USS Glenn, the Discovery's sister ship, suffered a catastrophe, Saru spoke up in Burnham's defense, describing her as the "smartest Starfleet officer [he] had ever met." Following the victory over General Kol and the Sarcophagus's destruction, Saru then confirmed that the spore drive had dropped Discovery into unknown space. After learning that they were in parallel universe, Saru then helped Cadet Tilly in posing as her counterpart after Lorca decided to have Discovery pose as the ISS Discovery. After Lorca and Burnham boarded the ISS Shenzhou, Saru was left in command of the Discovery. Saru, along with Tilly, then found Dr. Culber dead and in the arms of Lieutenant Stamets. With Tilly, Saru agreed to use the Mycelium spores to treat and heal him. Saru then had Tyler (who had been revealed to be Klingon sleeper agent Voq) beamed back aboard the Discovery with information on the USS Defiant's arrival to the mirror universe. Saru was able to decrypt the information on the Defiant, but much much of the information was redacted. When Dr. Pollard and her medical team were unable to hepl Tyler/Voq, Saru then allowed L'Rell in helping Tyler/Voq in easing his pain. Saru was then contacted by Burnham to come to the ISS Charon. Enroute to the Charon, Lt. Stamets came to and told Saru of his counterpart's damage to the Mycelial network and its eventual destruction of the entire multiverse. Saru was then contacted by Burnham, who told them that Lorca was really a Terran posing as his counterpart. After this revelation, Saru decided to take command and destroy the Charon before it destroys the entire multiverse. Following Discovery's arrival at the Charon's coordinates, Saru then spoke with Lorca, who offered to spare him and Discovery's crew in exchange for Burnham. At first, Saru agreed. However, when Burnham and Georgiou attacked Lorca, Saru ordered Discovery to open fire. Discovery was successful in disabling the Charon's shields. Saru then ordered Burnham to beamed aboard prior to destroying the Charon. Following the Charon's desctruction, Saru and the crew then used the destruction's shockwave to return to their universe. Instead of returning to their universe they were transported to a completely different quantum reality and into the year 2379. Saru remained on board as First Officer serving under Captain Tom Riker.